When an individual is exposed to an allergen, the body’s immune system goes into overdrive. IgE antibodies are produced to react against the allergens but these antibodies go after healthy mast cells. When the mast cells are under siege, the body releases histamine. Histamine causes inflammation of tissues and cells. This reaction is termed “hypersensitivity”. Hypersensitivity is divided into four areas: Type 1, Type 2, Type 3 and Type 4. Type 1 causes rashes and immediate reaction to the allergen. Type 2 is drug induced reactions and anaphylaxis. Type 3 is tissue inflammation conditions (lupus related). Type 4 produces contact dermatitis. The types of most commonly treated by medical professionals are 1, 2, and 3. There are several types of allergies: food, environmental, chemical, latex, tree, asthma, hay fever, and rhinitis. Atopic diseases like dermatitis, rhinitis, eczema, and allergic asthma involve IgE antibodies which are linked to genetic history. Genetic linked antibodies are not factors in drug or insect allergens. Researchers have defined some other basic components of allergens: amino acids, biochemicals, fatty acids, minerals, phenolics, sugars, Vitamin A, B Vitamins, Vitamin C, and Vitamin A. These components can trigger immune responses in individuals with allergic tendencies. Hypersensitivities can be linked to genetic or inherited allergies, digestion issues, drug related allergies, latex allergies, insect and food allergies. Genetic factors increase due to multiple family members having allergies. Digestion issues are linked to food as well as other allergies. Drug related allergies can suppress an already weakened immune system that can be cause further cell damage. Food allergies can cause not only gastrointestinal problems but can affect the rest of the body. 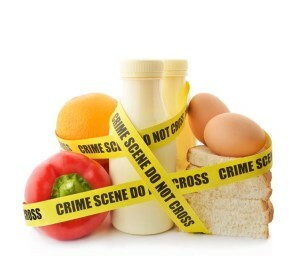 Known triggers of food allergies are milk, eggs, fish, wheat (gluten), shellfish, and tree nuts (including peanuts). Hypersensitivities can be traced to obesity, alcoholism, hay fever, rhinitis and other skin conditions. Non IgE allergies are not classified as a hypersensitivity. Non IgE allergies affect the nervous system. An allergy can affect every part of the body. Food and drug allergies can cause problems with the stomach, respiratory tract and skin. Environmental and chemical allergies can cause irritations in the respiratory tract and skin. Latex allergies are very common and cause major skin rashes. Two types of latex allergies are irritant contact dermatitis and allergic contact dermatitis. Tree allergies can affect the entire body. Nuts, especially peanuts fall into this category. Although peanuts fall into the nut category, a peanut is a legume. If the allergy is severe, anaphylaxis can occur. Insect stings(wasp and bees) can cause runny noses, throat swelling, skin irritation and in some cases anaphylaxis. Hay fever is responsible for runny noses, itchy and water eyes, and skin irritation. This condition is most common during the months when pollens and trees are active. 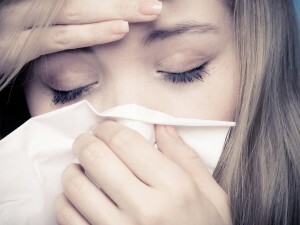 Rhinitis affects everyone year round. The symptoms are almost the same as hay fever. 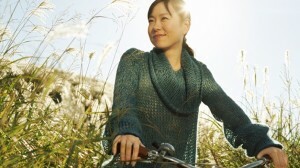 Immunotherapy shots or “allergy shots” are given to individuals to increase the tolerance of allergens. There is a disagreement as to whether the shots are effective but this practice seems to be the most common way to treat allergies. Allergy shots are excellent for people who are allergic to pollen, dust, animal and some environmental allergies but are not proven to be effective for food allergies. Some individuals have had success with allergy shots that eventually the allergy goes away and so does the need for the shots. The downside to immunotherapy is you must keep your scheduled shots in order for the therapy to work.